Jason Tamer Fabini (born August 25, 1974) is a former American football offensive lineman. He was originally drafted by the New York Jets of the National Football League (NFL) in the fourth round of the 1998 NFL Draft. He played college football at Cincinnati. Fabini played high school football at Bishop Dwenger High School in Fort Wayne, Indiana. Fabini attended the University of Cincinnati, where he was a three-time starter at left tackle and an All-Conference USA selection. In his junior season, he contributed to the school's first bowl-game invitation in 47 years. In 2009, he was inducted into the University of Cincinnati Athletics Hall of Fame. He was originally selected in the fourth round of the 1998 NFL Draft by the New York Jets, and head coach Bill Parcells. He became a starter at right tackle as a rookie. The next year he was lost for the season after suffering a torn anterior cruciate ligament, in the ninth game (against the New England Patriots). In 2000, he became the starter at left tackle and remained in that role for 5 seasons. 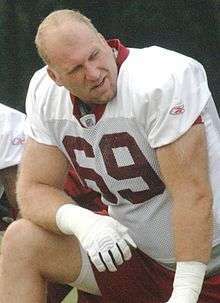 In 2005, he started 9 games at right tackle, before he was placed on the injured reserve list with a torn chest muscle. He was waived on February 22. On March 18, 2006, he signed with the Dallas Cowboys as a free agent, reuniting him with his former Jets head coach Parcells. Although he had the inside track for the starting right tackle job, he was passed on the depth chart by Marc Colombo and relegated to special teams duties. He was released on March 10, 2007. On March 26, 2007, Fabini signed a one-year deal with the Washington Redskins. He replaced an injured Randy Thomas at right guard in the second week and went on to start in 13 games. He re-signed to another one-year deal with the team exactly one year later. Following the end of the 2008 season, he was not re-signed. Fabini was in the movie Made, which starred Vince Vaughn and Jon Favreau. He played the role of Doorman #3.